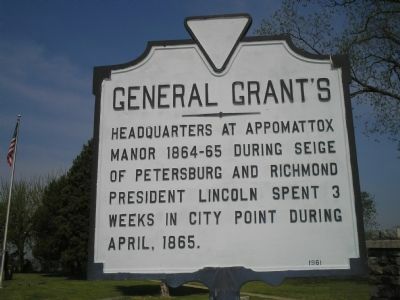 General Grant’s headquarters at Appomattox Manor 1864-65 during the siege of Petersburg and Richmond. President Lincoln spent 3 weeks in City Point during April, 1865. Location. 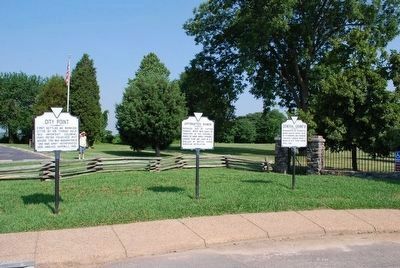 37° 18.926′ N, 77° 16.62′ W. Marker is in Hopewell, Virginia. Marker is at the intersection of Cedar Lane and Pecan Avenue, on the left when traveling north on Cedar Lane. Touch for map. Marker is near the parking lot of the City Point Unit of Pertersburg National Battlefield. Marker is in this post office area: Hopewell VA 23860, United States of America. Touch for directions. this marker); Porter House (within shouting distance of this marker); City Point’s Rails And Waterways (about 400 feet away, measured in a direct line). Touch for a list and map of all markers in Hopewell. 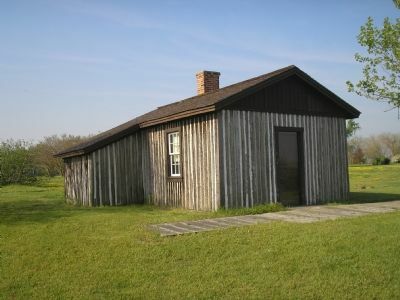 Gen. U.S. Grant made his headquarters in this cabin at City Point. 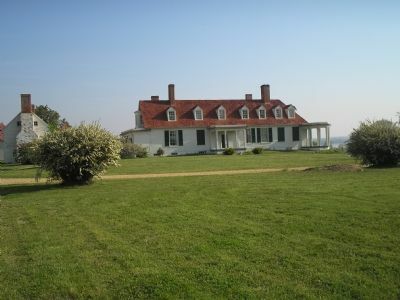 It is located a short distance east of Appomattox Manor. More. 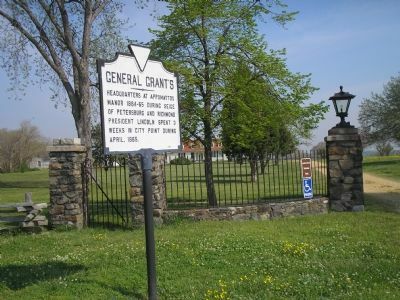 Search the internet for General Grant's Headquarters. Credits. This page was last revised on June 16, 2016. This page originally submitted on November 28, 2007, by Bill Coughlin of North Arlington, New Jersey. This page has been viewed 1,532 times since then and 9 times this year. Photos: 1, 2. submitted on November 28, 2007, by Bill Coughlin of North Arlington, New Jersey. 3. submitted on August 12, 2015, by Brandon Fletcher of Chattanooga, Tennessee. 4, 5. submitted on November 28, 2007, by Bill Coughlin of North Arlington, New Jersey. • Craig Swain was the editor who published this page.